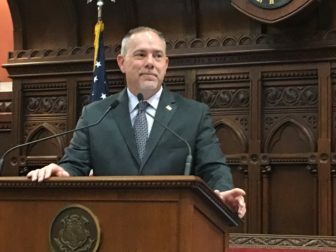 Speaker Joe Aresimowicz canceled plans Wednesday for a House vote on a measure to create an electronic tolling plan, saying it lacks support now to pass. Aresimowicz said several times in preceding days that he was planning a tolls vote on Wednesday. But during his regular meeting with Capitol reporters before the start of Wednesday’s session, when asked if he was ready to call the bill, Aresimowicz said, “I’m going to work as hard as I can” to secure passage before the session ends. But what about the planned Wednesday vote? House Democratic leaders released details Tuesday of the bill they hope to bring to a vote. The measure would direct the Department of Transportation to develop a detailed electronic tolling plan for state highways for legislative consideration next year — a plan that must provide significant commuter-pass discount rates for Connecticut residents. Another major change in the legislation is that, regardless of whether it is enacted this year, it would require a second, affirmative vote of the General Assembly in 2019, or later, before tolls could be established. An earlier version would have ratified the tolling plan, by default, if lawmakers approved this year’s bill but took no action in 2019. Although details of the bill still could change, Aresimowicz said, plans call for a base rate of 11.8 cents per mile during peak periods and 9.4 cents off-peak. Any motorist whose license plate is registered with the state tolling system would pay rates of 9.9 cents during peak periods and 7.9 cents off peak. But Connecticut residents would pay less. Those who buy a CT EZPass would get a 30 percent discount, which means rates of 5.5 cents on-peak and 4.4 cents off-peak. And for those who buy a special CT EZPass with a commuter rate, the cost would be discounted 20 percent more, or 4.4 cents on-peak and 3.5 cents off-peak. The speaker also conceded that election-year politics has been an obstacle. And legislators from both sides of the debate have been skeptical that any measure related to tolling could pass in the Senate this year. That chamber is split 18-18 between Democrats and Republicans. The alternate, he and other advocates say, is to watch an aging, overcrowded transportation infrastructure that already is an impediment to economic growth, fall into greater disrepair. Absent more funding, the state is facing scrapping some rail services, raising fares, and suspending 40 percent of planned capital projects worth about $4.3 billion in construction activity — including major highway projects such as rebuilding the Hartford viaduct and the junction of I-84 and Rt. 8 in Waterbury, known as the “mixmaster,” the Malloy administration says. A coalition of construction businesses and trades, Move CT Forward, launched an advertising campaign this spring to urge greater state investment in transportation. 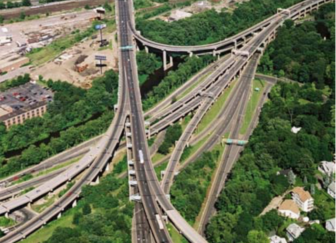 I think there’s been a lack of good information about tolls,” said Connecticut Construction Industries Association President Don Schubert, who supports the bill and whose group is part of Move CT Forward. Schubert added the standoff “is jeopardizing the more important issue,” which is stabilizing the Special Transportation Fund so the emergency cutbacks the governor has planned can be averted. The tolling measure also includes a provision that would gradually increase the transfer of certain sales tax receipts to the fund. It would receive an extra $20 million next fiscal year and more in the out years. 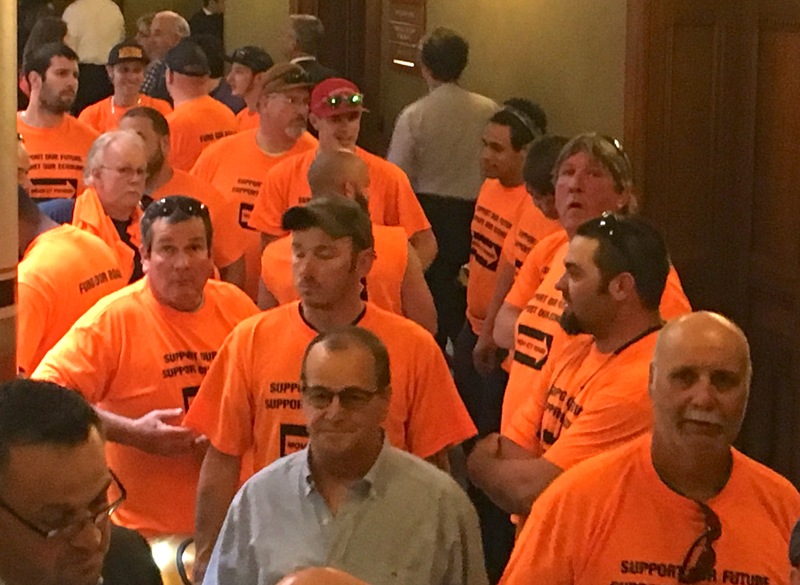 Adherents of Move CT Forward, a coalition of construction businesses and trades, show support for the tolls bill at the Capitol Wednesday.